The photo above shows my mare, Lexi, in the spring of 2011. She is not quite obese, but she is fat, weighing in at 950 at 14.2 hands. In 2011 she was chosen to participate in a study by the University of Minnesota on Equine Metabolic Syndrome (EMS) She is one of the breed types (Arabian) that may have a genetic pre-disposition to EMS, is an “easy-keeper”, and also exhibits a body type that also seems to be genetically predisposed to EMS: a tendency of regional adiposity (accumulation of fat in certain areas, particularly the crest of the neck, fat pads close to the tail head, around her mammary glands). During that study, she was tested for Insulin Resistance (IR)—a “pre-diabetic” like state) and her pasture and feed were analyzed for sugar and starch content ( nonstructural carbohydrates or NSC). (See my previous blog for more on this topic.) Fortunately, she tested negatively for IR, but her insulin response was less than desirable. Insulin resistance can lower the threshold for developing laminitis, and small management changes, such as introducing a new batch of hay or feed with higher levels of NSC, can increase stress, and may push IR horses over the edge. 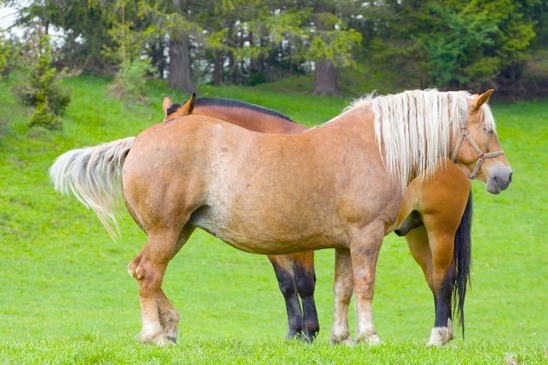 Rapid pasture growth (Spring/Fall for many of us) with increased fructose content in the grass typically increases the chance that laminitis can develop, particularly in at-risk horses, and especially if they are already fat. I had read about these horses, but had never owned one until now. My other horses fortunately don’t fit the profile, and aren’t affected. What do I do to help my mare stay healthy? I now weigh her with a weight tape weekly throughout the year, making sure she stays around 900 pounds, and I adjust her feed accordingly. Whenever grass begins to grow (if the lawn needs to be mowed, it’s growing), she is put in a dry lot for most of the day. I exercise her more frequently. I also have her hay analyzed, and I make sure she has a therapeutic level of Yea-Sacc (1 ounce twice a day). In the spring, I still let her graze, with a muzzle, 1 hour/day . The Yea-Sacc helps her gut’s natural flora adjust to the increased fructose level in Spring grass. She’s a happy (other than being on dry lot) healthy horse.